Food allergies and playgrounds: Please don’t bring snacks to playgrounds. It seems like such a little thing, but it could save a food-allergic child’s life. 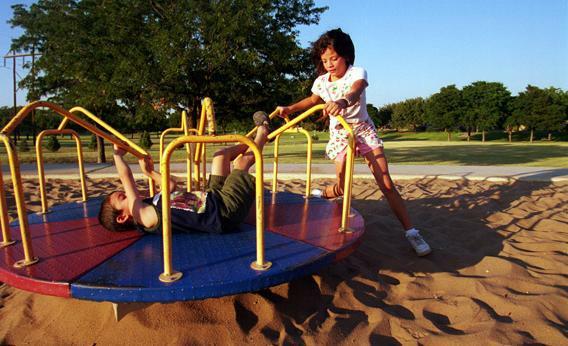 One child’s playground snack can cause anaphylaxis in another. Spring came to St. Louis a little later this year than it usually does, and the playgrounds where I go with my children are finally overrun with joyful kids. They’re also overrun with food. Other parents may not notice that fact, but I do: My 2-year-old daughter, Claire, is allergic to peanuts, tree nuts, eggs, and dairy, and many common playground snacks would be dangerous to her if she ate them. I don’t think it’s an overstatement to say that allergic families live in a parallel universe in which what is harmless to everyone else requires extreme vigilance from us. In the months after Claire’s diagnosis, my relationship to food changed so much that I felt as if I had woken up one day, still living in the same country I’d always lived in, but that I could no longer speak the language. Around other families—at a picnic for my husband’s colleagues and their families, for example—when I watched other children handle food, I felt like they were holding tiny snakes. Maybe the snakes were poisonous and maybe they weren’t; maybe they’d escape, and maybe they wouldn’t. But this is the comparison that’s ultimately stayed with me: Being the parent of a child with food allergies is like someone suddenly telling you the colors orange and gray are harmful to your child. I can guarantee that you’d soon realize orange and gray are everywhere. On a recent afternoon trip to the playground, I noticed the Goldfish crackers first. They were sprinkled, some already crushed to a powder, between a climbing toy and the swing set—presumably a snack that some kid had spilled. When we got home, my husband told me he’d also seen an almond by one of the slides. The next weekend, at a different playground, two open containers of melting milkshakes sat on the miniature metal picnic table, and leftover Easter candy dotted the mulch. After my 4-year-old daughter, who doesn’t have allergies, kept trying to surreptitiously pocket little chocolates, I finally picked them up with a tissue—I didn’t know if they contained nuts—and threw them away myself. One of the first things that I realized after Claire’s allergies were diagnosed, shortly before her first birthday, was that I had to accept the fact that the world is full of people who just ate a peanut-butter sandwich and didn’t wash their hands. There’s a lot I can’t control. But I am hopeful that if parents of nonallergic kids had a better understanding of how scary their children’s ostensibly harmless snacks are, they might act differently. So here is my plea: If your child snacks at the playground, please don’t let her run around while she’s eating. Please don’t leave the food unattended and accessible to other kids. If your child spills, help her clean it up. And after she’s finished, please use wipes to wash her hands, not antibacterial gel; hand sanitizer doesn’t kill the proteins in most foods that cause allergic reactions, and tiny amounts of such proteins can literally be lethal. How much of a threat does, say, a little boy munching yogurt-covered pretzels really pose to Claire? The biggest risk, of course, is that she’ll get hold of one and eat it, which would likely cause her to break out in hives; my great fear, the great fear of any parent of an allergic child, is that it would result in fatal anaphylaxis. (Among the many confusing aspects of food allergies is that previous reactions aren’t necessarily predictors of subsequent reactions in terms of severity.) Claire also has a contact reaction to dairy, meaning that her skin breaks out in a rash in the places where dairy has touched it without her having ingested any. If I thought the chances of any of these reactions occurring were truly high, I wouldn’t take Claire to playgrounds in the first place. But still, whenever allergenic food is present, it’s nerve-wracking. The eight most common allergens, accounting for as many as 90 percent of all allergies, are peanuts, tree nuts, milk, egg, wheat, soy, fish, and shellfish. As every parent of an allergic child knows, these ingredients hide in surprising places—there can be milk in potato chips, say, and manufacturers often make dried fruit on the same equipment with nuts—and I don’t think it’s realistic to expect people to pore over ingredient labels if they don’t need to. That’s why my preference would be for kids to avoid eating food at playgrounds altogether, but I understand this possibility is probably about as likely as my laundry washing itself or me having a moms’ night out with Tina Fey and Amy Poehler. If you do bring snacks, something like fresh fruit is statistically less likely to cause problems than donuts or cheese sticks—though of course statistics aren’t much comfort to the dad of a kid who’s allergic to strawberries. If I seem here like a particular kind of parent—a fussy, hovering, self-righteous priss—let me say this: I kind of am. But the fact that we live in the Age of the Irritating Parent shouldn’t be conflated with the rise of allergies. According to the advocacy organization Food Allergy Research and Education, 1 in 13 American children under age 18 now has a food allergy, as does 1 in 10 preschoolers. The food-allergy rate in the U.S. rose 18 percent between 1997 and 2007. It’s true that I happen to be a neurotic mom. It’s also true, as demonstrated by skin tests, blood tests, food challenges in the doctor’s office, and accidental exposures, that my daughter has a serious medical condition. So the fact that I wish parents wouldn’t let their newly walking toddler stagger around the sandbox with that sloshing sippy cup of milk or their 7-year-old practice his throw with Ritz Bits—I promise it’s not that I’m trying to tell them how to raise their kids. They probably just want to keep them fed to prevent a meltdown, which I sympathize with. (For the same reason, we bring fruit squeezers for the ride home.) And I wouldn’t presume to instruct parents what to do at their own house. You do not need to bake and serve a vegan cake at a birthday party. (Claire brings her own cupcake.) I realize all bets are off at a restaurant, which is why our family doesn’t go to them. But in the communal space of a playground, food isn’t the main attraction. Many times since I became a mother, I’ve been struck by the effortless bonding among parents. On an airplane when Claire was about 7 months old, she had a disgustingly messy diaper on a bumpy flight during which passengers weren’t supposed to get up from their seats. The woman next to me, rather than holding her nose and glaring, offered to hold Claire’s head and torso while I changed her. As it happens, the woman didn’t speak fluent English, but she managed to convey that she, too, had a daughter. It is this spirit of generosity and compassion that I hope to appeal to in persuading parents to handle food at playgrounds more carefully. Obviously, the circumstances of our lives vary widely, but all of us with children are trying in our own best way to look out for them. The next time you bring food to the playground, please think about what you would hope other people would do if your child was in Claire’s situation. Update, 3:52 p.m.: This article’s headline was changed from “Please Don’t Bring Snacks to the Playground” to more accurately reflect its overall argument.